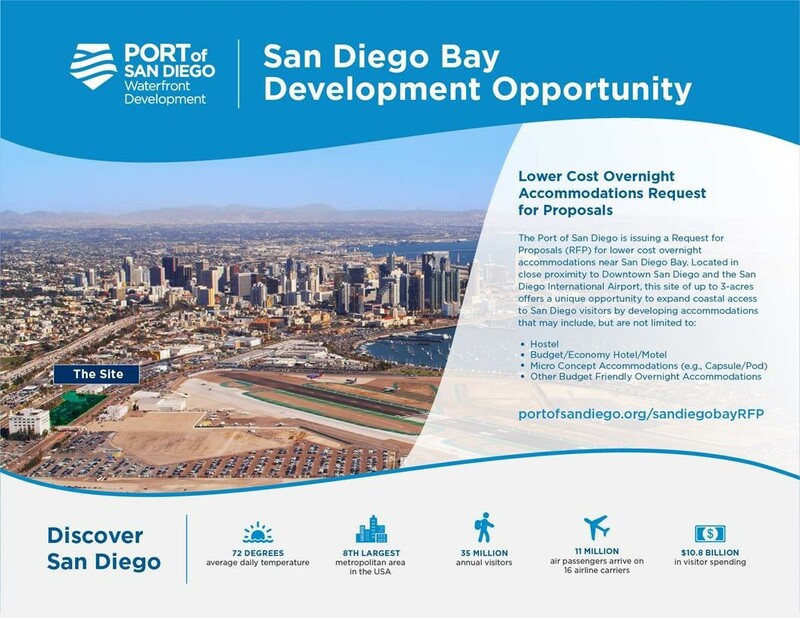 As part of efforts to ensure that all Californians and visitors from a variety of backgrounds and incomes are able to enjoy the area’s full range of coastal experiences, the Port of San Diego has issued a Request for Proposals (RFP) from well-qualified firms to develop and/or operate lower cost overnight accommodations. This could include, but is not limited to, a: hostel, budget/economy hotel/motel, micro concept accommodations (e.g., capsule/pod), or other budget-friendly overnight accommodations. The development site along Pacific Highway is approximately three acres and is conveniently located just east of San Diego International Airport and steps away from the Middletown Trolley Station. The site is also within a short walk or bike ride from popular visitor destinations including: Little Italy, Gaslamp Quarter, Waterfront Park, Balboa Park, USS Midway Museum and Maritime Museum of San Diego. Interested parties can download the RFP on PlanetBids. February 7, 2019 at 1 p.m.
March 7, 2019 at 1 p.m.